The pay-TV market is shrinking, while broadband subscriptions are picking up steam, according to a pair of reports from the Leichtman Research Group (LRG). LRG estimates that the top multichannel video providers, who represent around 94% of the market, shed a total of 344,318 subscribers during the second quarter, while the top broadband providers (many also doubling as pay-TV providers) added 294,304 subscriptions during the same period. LinkedIn’s community grew 9.2% compared to the previous quarter, hitting 238 million members, according to second quarter company results announced August 1. This represents the largest percentage quarterly gain in users since the first quarter of 2012. Average monthly unique visitors or UVs reached 143 million during the quarter — representing an 8.3% gain from the previous quarter. That’s marginally better than the quarterly gain in UVs realized in the previous four earnings results. Page views continue to skyrocket as users linger to consume content. This activity is in large part due to the success of the Influencers program — a kind of blogging platform for thought leaders to share expertise. LinkedIn has also launched industry-specific news channels. LinkedIn’s strong revenue performance in the quarter shows that the company is successfully monetizing all the activity on its platform. Interestingly, ad sales were LinkedIn’s slowest-growing business, but it offset that drag with a strong showing in its personnel recruitment product (Talent Solutions), for which revenue was up 69%, and premium subscriptions, up 68%. Download the chart and data in Excel. 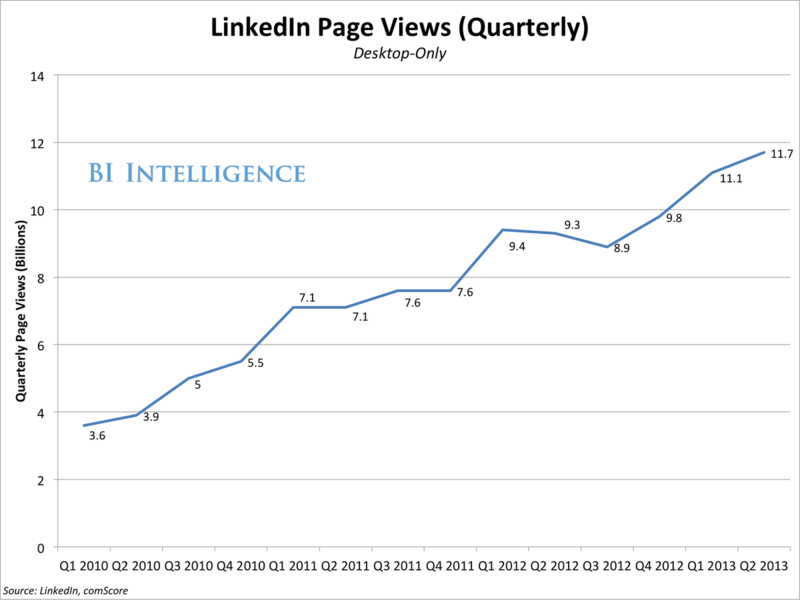 Related Report: Learn how to leverage LinkedIn’s platform for ! generati ng B2B sales. Subscription streaming service viewing may be eroding consumption of premium cable channels such as HBO and Starz, according to details from a new report released by GfK. The report asked users of Netflix, Hulu Plus and Amazon who previously used premium cable channel or pay-TV service video-on-demand (VOD) services if their consumption of those services had declined as a result of their subscriptions. Nearly three-quarters of Netflix subscribers in the US still kept their cable, satellite or telecom pay TV subscriptions, according to a June 2013 study from Cowen and Company. But another 20% reported having gotten rid of their pay TV subscription, raising questions about whether more Netflix subscribers could soon become cord-cutters. Cord-cutting is typically associated with those in the youngest age bracket, and the survey found this to hold somewhat true. However, there was also a notable propensity to cut the cord among Netflix subscribers between 30 to 44 years old, with 41% having cut pay TV. Overall, this age group was more likely to subscribe to Netflix than 18- to 29-year-old respondents. 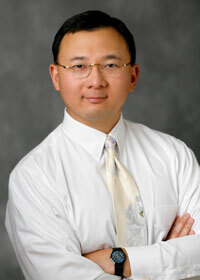 Few technologies in the world have created as immediate and widespread an impact as cell phones. Hand-held phones have completely changed how the world communicates in the span of a decade or so. We are only a few years from there being a mobile phone subscription for every human being on earth. According to the International Telecommunications Union, there were 6.4 billion mobile phone subscriptions at the end of 2012, translating to 91% penetration globally. That’s up from a mere 662 million subscriptions a decade ago. Of course, mobile subscriptions are not spread evenly between the developed and developing world, and there are many people in the developing world without mobile phone service. Penetration was 124% in the developed world, as a significant number of users have more than one phone. Nonetheless, penetration was still 84% in the developing world. The ITU forecasts that penetration will take another jump this year. It expects there to be 6.8 billion mobile subscriptions at year-end 2013, good for 96% penetration. It forecasts penetration in the developing world will grow to 89% this year. Elsewhere, the ITU forecasts there will be 2.1 billion mobile broadband subscriptions (i.e., smartphones) by the end of 2013, suggesting global smartphone penetration of 30%. Click here to download chart and data in Excel. Hulu’s future ownership may be in question, but the video streaming site is apparently doing fairly brisk business on the paid subscription front. During an advertiser event this morning, the site announced that it has managed to double its Hulu Plus accounts in the past year, up to four million. 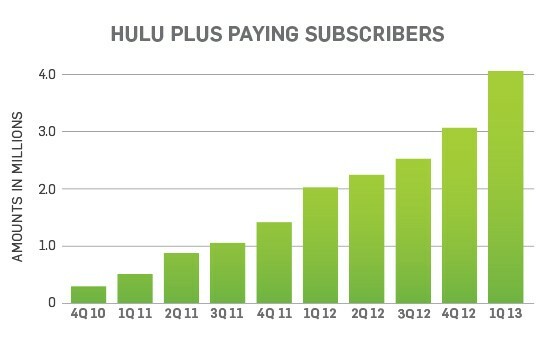 The site’s revenue also hit a record for the first quarter of the year, though Hulu’s not giving out any numbers. As with rivals Netflix and Amazon, the company’s making a big bet on original programming, with a number of exclusive series, including the animated The Awesomes and western Quick Draw. In the past year, we’ve seen three quarters of the top 100 brands establish active profiles on Google+ and their customers have followers. These brands now have 20.9 million fans which is a growth of 9400% since December 2011 when only 222,000 followed them collectively. But this growth isn’t that widespread across the hundred. 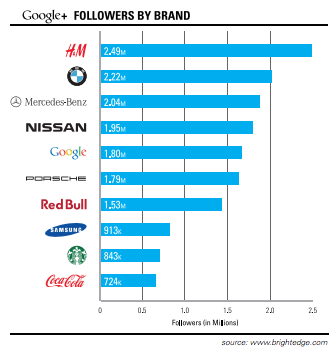 In fact, the top ten brands on Google+ account for four out of five followers (78% of the total top 100 fans) which is 16.3 million followers. Four out of ten of these are big automotive brands including BMW, Mercedes-Benz, Nissan and Porsche, who are definitely taking advantage of the visual nature of Google+ (click on the image to the left to enlarge). In the last year, there’s also been a marked improvement of Google+ pages showing in – surprise, surprise – Google search results from 0% to 20% in 2012. Obviously the marked improvement in followers and results have been due to major brand adoption and 25% of the top 100 integrating Google+ into their home page. Youtube on the other hand, is continuing to grow into the brand space, slowly shedding itself of the rapid association with cat videos. 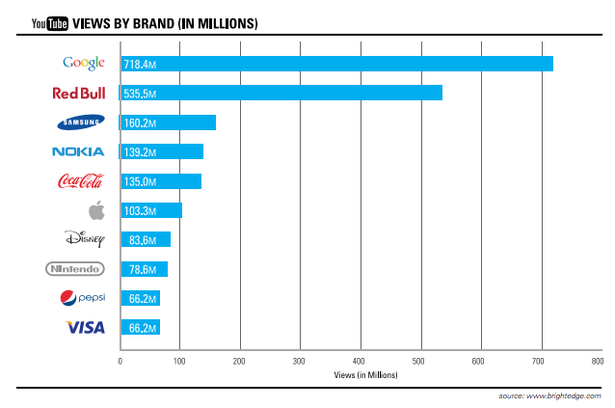 87% of the top brands have their own YouTube channel and collectively the top 100 have had over 3.15 billion views of their videos. As you can see in the chart above, Red Bull, Google and Apple lead other brands in terms of subscribers and as YouTube makes the move to paid subscriptions, we’re sure to see even more broadcasters and brands follow. Are you surprised by the numbers? What do you see happening with Google+ and YouTube and big brands in the coming year? 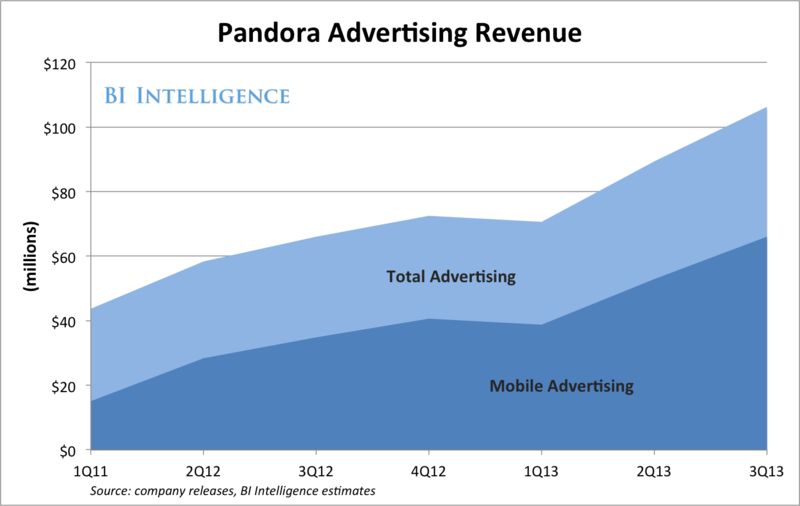 Mobile continues to drive Pandora’s ad business. Mobile ad revenues for its fiscal third quarter were $66 million, up from an estimated $53 million a quarter prior. Mobile accounted for 62 percent of total ad revenues, compared to 59 percent in the second quarter. Overall mobile revenues, including subscriptions, increased $15 million in the quarter to $74 million. Pandora is a prime example of how mobile is transforming what were once Web-based companies. With 77 percent of usage now coming from mobile— not to mention a majority of revenues— Pandora is essentially a mobile company. ComScore released its annual US Digital Future in Focus report this week, offering a year-end wrap of many of the trends its tracked throughout the past year and a look towards the next. 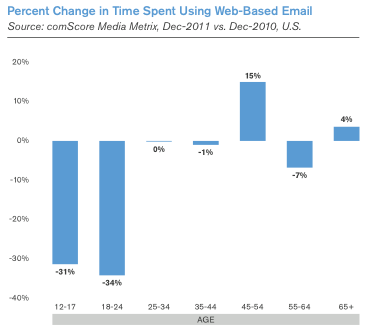 One of the more telling stats concerns email use among those in their teens and twenties. According to the report, web-based email use among 12-17 year olds dropped 31 percent in the past year, while use among those 18 to 24 saw an even bigger drop of 34 percent. Some of that can no doubt be attributed to Facebook and other email alternatives, but a big factor is the growth of email use on mobile devices; both of those age groups saw double-digit growth in that respect, with mobile email use jumping 32 percent among 18 to 24 year olds. In terms of sheer growth in the past couple of years, though, there’s not much that matches the trajectory of tablets (obviously aided by one in particular). ComScore notes that that US tablet sales over the past two years have topped 40 million, a figure that it took smartphones as a category a full seven years to reach. Another area that saw some considerable growth in 2011 is digital downloads and subscriptions (including e-books), which jumped 26 percent compared to the previous year, leading all other areas of e-commerce. The full report and some videos of the highlights can be found at the source link below. ComScore r! eport fi nds drastic shift from web-based to mobile email among younger users in past year originally appeared on Engadget on Sat, 11 Feb 2012 13:12:00 EDT. Please see our terms for use of feeds. When Apple announced their digital subscription rules and locked down the iPad, publishers weren’t exactly rushing to bring their subscriptions over. And then all of a sudden Conde Nast, Hearst, and Time Inc brought their magazines to the iPad. What changed? According to Forbes, the biggest hurdle for publishers wasn’t the 30% cut that Apple was going to take away from them, but rather the lack of information on the subscribers. They were worried that because users get to ‘opt in’ to giving up their personal information that nobody would do it. They were wrong. In fact, 50% of subscribers have been giving publishers their information.